JobScout is a fully responsive free WordPress theme for human resources companies and recruiting agencies to create their online presence and publish the available vacancies on the website. The theme is built over popular WP Job Manager plugin which is a job listing plugin and helps you add job board functionality on your WordPress website. You can build a professional job board website using this theme without any coding knowledge or experience. It is a highly customizable theme and comes with easy to use customizer to allow you to customize your website with live-preview. You are using WordPress to create your job listing website. You are looking for an attractive web template to create your job listing website. You don’t want to invest a huge amount of money hiring a developer to create a website for your business. You need fast and reliable support whenever you have technical issues with the website. You want free demo content that can be imported with a click to kickstart your website. With the increasing number of smartphone and portable device users, your website needs to be responsive and mobile friendly to have a wider reach. Also, as per research, more than 50% of Google searches occur on smartphones. Hence, to target every type of audience, you need a fully responsive and mobile-friendly website. 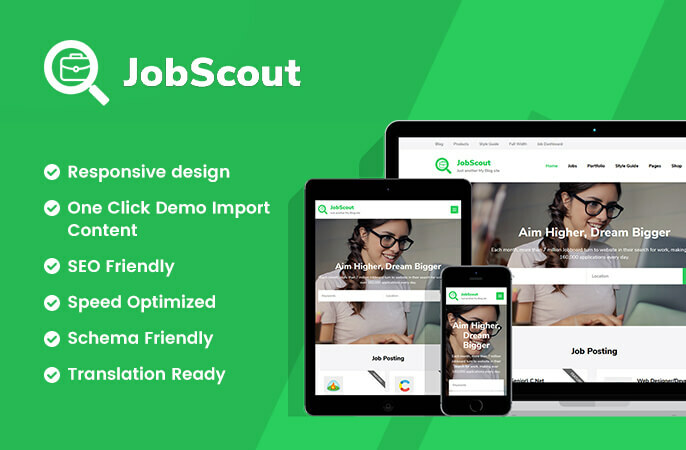 JobScout Free WordPress theme features a flawless mobile-friendly design which ensures that your website displays correctly on every devices and screen sizes giving your visitors an excellent user interface. Also, JobScout free theme passes Google mobile-friendly test which gives a boost in the ranking of your website in the search engine results. You can import all the images, text, and settings from the live demo of JobScout free theme with a click because we believe you should spend more time on your venture than on setting up your website. JobScout free is fully compatible with the popular WP Job Manager plugin to allow you list job easily on your website. WP Job Manager is a job listing plugin developed by Automattic to add job-board functionality to the WordPress website. With JobScout free WordPress theme, you can help the job seekers to search for their dream job with filters such as job type, category, keywords, and location. This feature helps job seekers find an appropriate job for them without much hassle. JobScout free theme is fully compatible with WPJM Extra fields plugin to allow your employers add extra salary and important fields to WP Job Manager plugin. The plugin adds extra fields on job submission either. JobScout free is fully compatible with popular WooCommerce plugin to allow you sell your services via your website. JobScout free theme features an advanced search form on the banner section. 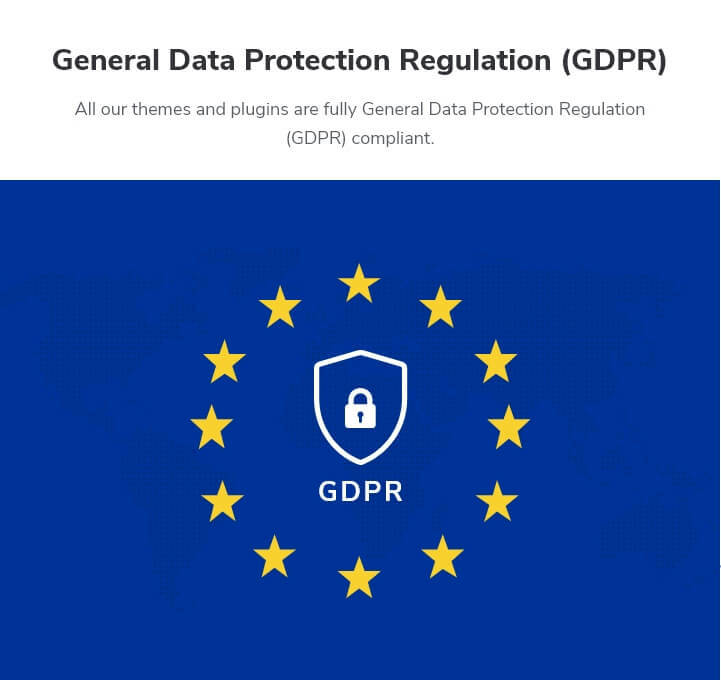 The banner section is displayed on the top of the website below the header and is very effective in keeping your visitors engaged on your website. The search form on the banner section allows your visitors to search for jobs based on their interest, categories, and location. The search form makes the searching job easier providing better user experience to your visitors. The Job Posting section allows you to display the latest vacancies available on the homepage of your website. JobScout free theme is a conversion focused theme. The theme features a Call to Action section of the homepage so that you can engage your visitors on the website and convert them into customers. You can keep your visitors updated with the latest news stories in your field with the blog feed section. With the blog section on the JobScout free theme, your website will never look stale and outdated. People like reading what other people have to say about your company. This theme includes a testimonial section on the homepage so that you can show your visitors what your clients have to say about your company and attract more customers. You can display the logos of your clients on this section of the homepage of your website. This section will help you introduce your clients to the visitors and create a strong portfolio of your business. Research shows that even a second matters when you are offering services online. There are instances where online businesses have failed because they had a slow website. On top of the usability, Google has also made speed an important aspect of its ranking algorithm. So, it is critical that you have a website that is super fast! JobScout free WordPress theme has performance-optimized codes that will make your website load faster so that you can beat your competitors with ease. JobScout free WordPress theme is an SEO friendly theme to help your website climb heights in search engine rankings. This theme is developed by implementing our expert SEO team’s expertise and knowledge so that search engines can easily find your website and rank it above your competitors on the search results page. Search engines love websites that are easy to understand, so we have embedded JobScout free theme with Schema.org markup. Schema.org ready code will help you rank higher in search engines. JobScout Free WordPress theme comes with easy to use built-in live customizer to help you customize your website with live preview. You can make changes to your website and see its preview without saving it using the live customizer. You can build your dream website within no time using live theme panel. JobScout free WordPress theme has an option that allows you to show the last updated date on the single post page. This feature will help you rank better in Google as Google prefers to rank recently updated posts. The theme works seamlessly with the WooCommerce plugin which means you can sell your services and receive payments online using your website. JobScout free WordPress theme is cross-browser compatible, which means the theme will work seamlessly on any browser your visitor is on. The theme is tested on Chrome, Firefox, Microsoft Edge, and Safari. JobScout Free WordPress theme has ample space for widgets. You can add and manage the widgets you require without compromising the design of the theme. Widget ready design and code allow you to customize your website as you desire easily. With the perfect font type, size, spaces, and contrast, JobScout free theme makes sure that your content is easy on the eye and your visitors enjoy reading what you have to say. Don’t let the language barrier come between you and your website. JobScout free theme supports localization so that you can use the theme in your local language. Do you use right-to-left (RTL) scripts like Arabic? Well, worry not! JobScout free theme supports both LTR and RTL languages. You can write content with confidence! You can easily add your own logo on your website using the JobScout free WordPress theme. Want to modify some CSS effect google fonts or the change color of a section? JobScout free theme allows you to easily add CSS effects right from the customizer. JobScout free WordPress theme comes with extensive theme documentation to help you set up your website. Just follow the step by step guidelines on the documentation and your website will be ready in no time.